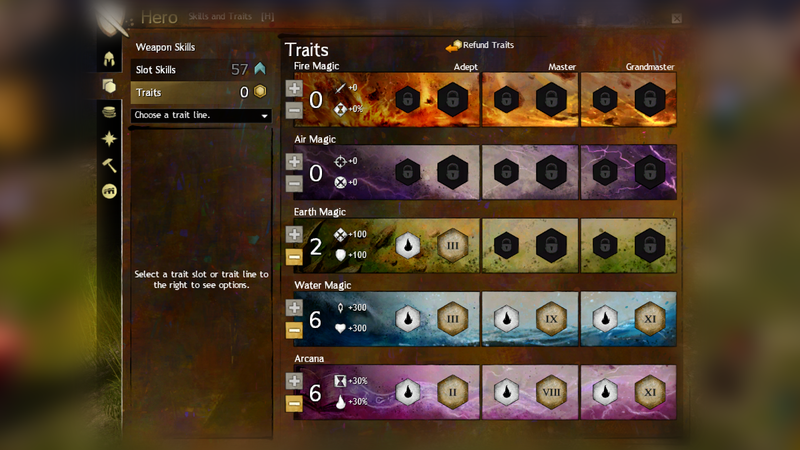 In this guide we provide players with the current Meta build for Guild Wars 2's Elementalist. The Dagger/Dagger Elementalist is one of the most sought after classes in Guild Wars 2’s PvP. It is flexible, fast and deals massive amounts of damage. Due to its Celestial Amulet, Might stacking and Cantrips it also has significant survivability. Move 2 points from Earth Magic to Air Magic for an much more offensive build. You can then swap Zephyr’s Boon over Elemental Shielding. The D/D Elementalist has huge flexibility and as a result is both hard to learn and master. If you stick with it, it is a formidable class that benefits any Structured PvP team. Stomping: This build offers two ways to successfully kill downed players. Mist Form and Armor of Earth provide Immunity or Stability. Using either, permitting your target doesn’t stealth or Mist Form away will allow you to kill them. Might Stacking: Due to using Celestial Amulet, Might stacking is paramount to this build. Each time you change Attunement you’ll gain Might. In addition, you’ll gain extra stacks of Might when you Blast in Fire Fields. Blast Finishers: Your Blast finishers are Frozen Burst, Earthquake and from Evasive Arcana Trait, Earth Attunement when dodging. Point Defense: Although you’re capable of dealing huge damage when you have high amount of Might stacks, you can hold a point for long periods due to your mobility and condition cleansing. Roaming: The mobility of this build makes it excellent for roaming. It is however key that you learn where you’re best served. With Ride the Lightning or Conjure Fiery Greatsword you can move around the map incredibly quickly. Team Support: The primary reason why a D/D Elementalist is so powerful is because of its team utility. With its splash heals, and Elemental Attunement which provides Boons to all players around you when (depending on which Attunement you’re in) makes you a formidable opponent. Make It Count: Burning Speed, Earthquake and Updraft are three of your most powerful skills. Try to save Earthquake and Updraft for finishing someone off instead of opening a fight. In addition, Burning Speed is incredibly hard to “land” if your opponent is strafing or moving a lot. Pairing Burning Speed after an Updraft is incredibly powerful and will almost always guarantee you hit your opponent. Swiftness Stacking: It’s incredibly important that at the start of the match you stack Swiftness on your team. Using Eruption (Earth Attunement) + Static Field (Air Attunement) combined with Frozen Burst (Water Attunement) is often all you’ll need. However, if you’re experience you can swap in Staff quickly to use Windborne Speed before swapping back out to D/D.